Neat old Colt M1917 .45ACP revolver. 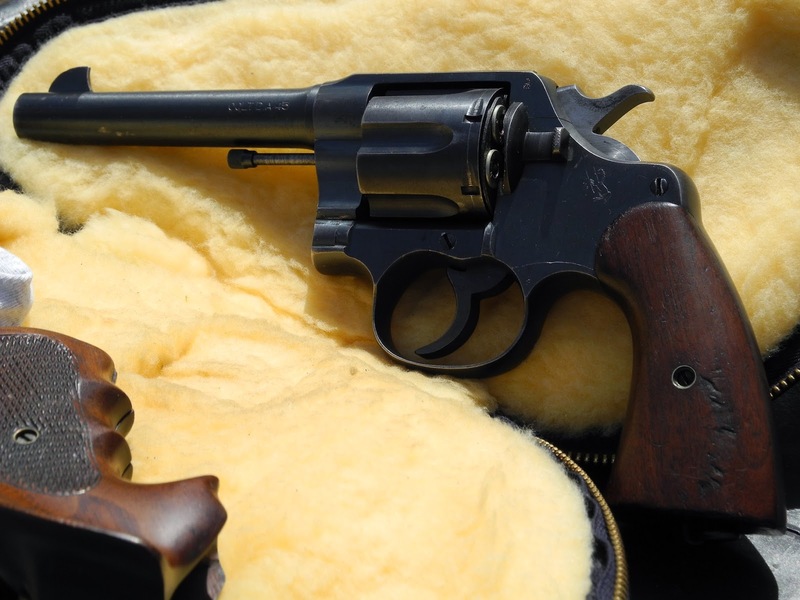 If you think an N-frame has a big grip and a long trigger reach, you need to handle one of these old horse pistols; an N-frame is downright svelte compared to a New Service. If ten percent of troops issued these could get a good trigger reach for double action fire, I'll eat my hat. There must've been a whole lotta "h-gripping" goin' on. This was an early M1917 with no shoulder in the chamber to support the case mouth. Later M1917s can be fired without moon clips, but you'd have to pluck the empties out one by one. With the earlier guns, the cartridges actually headspace on the moonclip; dropping a rimless .45ACP round in without one will cause it to just slide straight out the front of the cylinder.